The ability to quantify the capacity of a central nervous system (CNS) drug to cross the human blood-brain barrier (BBB) provides valuable information for de-risking drug development of new molecules. Here, we present a study, where a suitable positron emission tomography (PET) ligand was not available for the evaluation of a potent muscarinic acetylcholine receptor type-1 (M1) allosteric agonist (GSK1034702) in the primate and human brain. Hence, direct radiolabelling of the novel molecule was performed and PET measurements were obtained and combined with in vitro equilibrium dialysis assays to enable assessment of BBB transport and estimation of the free brain concentration of GSK1034702 in vivo. GSK1034702 was radiolabelled with 11C, and the brain distribution of [11C]GSK1034702 was investigated in two anaesthetised baboons and four healthy male humans. In humans, PET scans were performed (following intravenous injection of [11C]GSK1034702) at baseline and after a single oral 5-mg dose of GSK1034702. The in vitro brain and plasma protein binding of GSK1034702 was determined across a range of species using equilibrium dialysis. The distribution of [11C]GSK1034702 in the primate brain was homogenous and the whole brain partition coefficient (VT) was 3.97. In contrast, there was mild regional heterogeneity for GSK1034702 in the human brain. Human whole brain VT estimates (4.9) were in broad agreement with primate VT and the fP/fND ratio (3.97 and 2.63, respectively), consistent with transport by passive diffusion across the BBB. In primate and human PET studies designed to evaluate the transport of a novel M1 allosteric agonist (GSK1034702) across the BBB, we have demonstrated good brain uptake and BBB passage consistent with passive diffusion or active influx. These studies discharged some of the perceived development risks for GSK1034702 and provided information to progress the molecule into the next stage of clinical development. Clinical trial details: ‘Brain Uptake of GSK1034702: a Positron Emission Tomography (PET) Scan Study.’; clinicaltrial.gov identifier: NCT00937846. The main goal of early phase drug development is the demonstration of substantial target engagement at doses which are safe and tolerable and the determination of a therapeutic dose range. 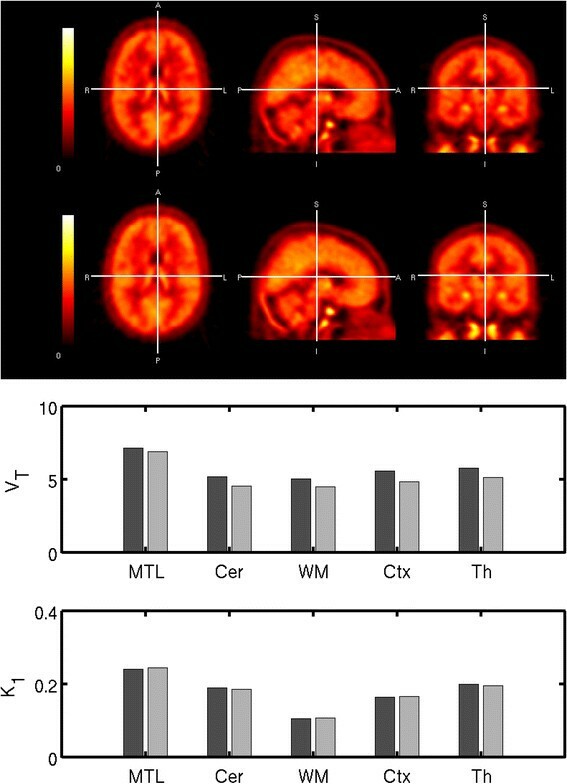 Positron emission tomography (PET) provides a unique technology for establishing the relationship between the plasma concentration of a compound and the degree of target engagement in tissues such as the brain, which are not accessible by other methods. The method of choice for defining this relationship is the use of a well-understood probe (or radioligand) which allows the quantification of target availability at baseline and following the administration of various doses of a novel drug. This approach allows the construction of a realistic pharmacokinetic model relating the kinetics of a novel drug in blood and plasma to that in tissue and enabling the prediction of target occupancy in future clinical studies . The practical limitation of this approach is the requirement for a well-characterised PET radioligand suitable for the quantification of the target examined. While a range of radioligands are available for the central nervous system (CNS), a large number of targets do not have a suitable radioligand. An alternative, indirect, method to obtain target occupancy information in these cases is to estimate the ‘free’ or unbound concentration of the drug in the tissue of interest (CFT) by directly labelling the drug molecule. The total concentration of a drug in tissue is of limited utility, as the non-specifically bound fraction is pharmacologically inactive and thus the information is restricted to providing confidence in Blood-brain barrier (BBB) penetration as a binary phenomenon. On the other hand, CFT can be combined with an estimate of the affinity of the drug for its target (KD), obtained from suitable in vitro or pre-clinical studies, to obtain an estimate of target occupancy. While such an approach makes several assumptions about the shape of the dose-occupancy relationship and the equivalence between in vitro-derived KD measures and the true in vivo KD, it provides a practical method for estimating target occupancy information in the absence of a well-characterised PET radioligand. The theory underpinning this approach has been fully described in a recent manuscript ; hence, we present a short summary only. The main goal of a ‘biodistribution’ PET study is thus to test the assumption that the drug crosses the BBB and to assess whether the transport is consistent with passive diffusion. The distribution of a drug in the tissue of interest can be evaluated following its labelling with a radionuclide. The substitution of a 12C or 19 F atom by the positron emitting isotopes 11C or 18 F enables the quantification of the drug distribution in tissue over time, without changing its physiochemical or pharmacological characteristics. In principle, one can estimate the total volume of distribution (VT), for the drug in the brain, which is equivalent to the equilibrium partition coefficient for the drug between brain and plasma. If the VT of a labelled drug is not reduced following the administration of pharmacologically relevant dose of the same drug, the total brain concentration of the drug (CT) can be taken to measure the sum of the free and the non-specifically bound components. 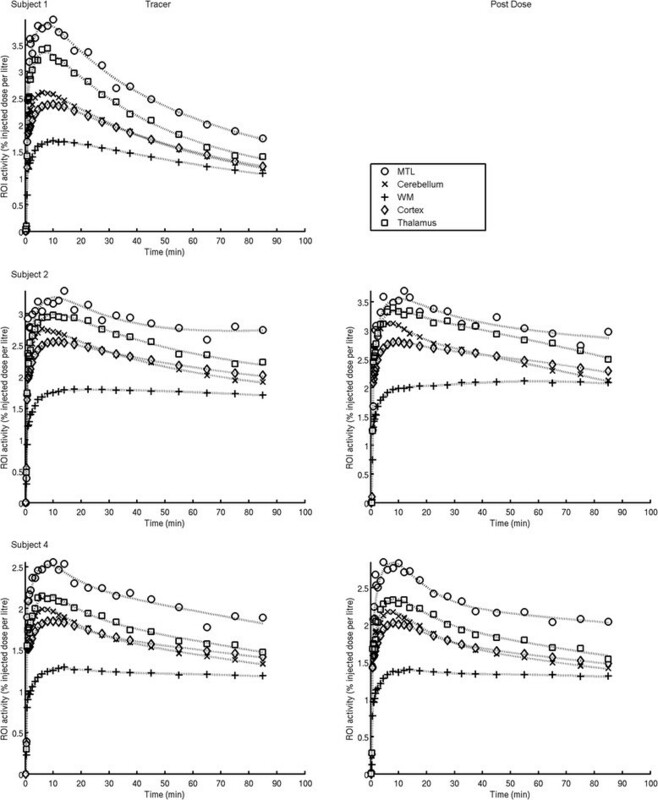 In this case, the VT will be independent of the dose of labelled compound administered and measurements made at tracer concentrations will provide an adequate estimate of drug distribution at pharmacological doses. It is worth noting that if the specific binding component of a labelled drug is not negligible compared to the free and non-displaceable components, the labelled drug may be used as a radioligand to enable a direct examination of target occupancy. A VT measurement from a PET biodistribution study can be compared to the f P/f ND ratio, and passive diffusion can be assumed if the two are similar. Equilibrium dialysis provides a practical method for measurements of brain tissue f ND (and also f P if necessary) . We have applied the methodology above to examine the distribution of GSK1034702 in the primate and human brain. GSK1034702 is a selective muscarinic-1 (M1) receptor allosteric agonist, which offers a potential therapy for the treatment of cognitive dysfunction in neurodegenerative disorders. It belongs to the series of novel N-substituted benzimidazolones recently described –. Muscarinic acetylcholine receptor (mAChR) agonists such as xanomeline have produced some efficacy in the treatment of cognitive dysfunction in patients with Alzheimer's disease (AD) and schizophrenia (SZ) ,. The therapeutic potential of the cholinergic agents tested thus far (cholinesterase inhibitors and muscarinic agonists) is modest and is thought to be limited by peripheral m2AChR and/or m3AChR-related side effects, such as gastrointestinal disturbances . The discovery of an allosteric (or ectopic) site for m1AChR that is not conserved across mAChR subtypes has provided the opportunity to develop m1AChR agonists with true receptor selectivity . Allosteric m1AChR selective agonists are postulated to display reduced side effects, and thus greater utility, compared with the existing non-selective orthosteric agonists. In an initial study, in healthy smokers using the nicotine abstinence model of cognitive dysfunction, GSK1034702 improved episodic memory . GSK1034702  is a potent allosteric agonist at human recombinant m1AChR (pEC50 = 8.1 ± 0.1, intrinsic activity (IA) = 0.78 ± 0.02) with 100-fold selectivity over human m2-5AChR receptors and with >90 over other molecular targets from a variety of classes. GSK1034702 is a weak substrate for P-glycoprotein (PGP) (efflux ratio of 2.6:1 in MDCK cell line expressing human MDR1) and has displayed some species variability in brain-to-plasma ratios (brain/blood ratios of 0.4, 0.6 and 2.0:1, in mouse, rat and marmoset, respectively; GlaxoSmithKline (GSK) data on file). Therefore, the delivery of GSK1034702 into human brain could have been adversely affected. Initially, the primate study was carried out in order to demonstrate that [11C]GSK1034702 crossed the BBB in primates, before proceeding to expensive human studies. The human study aimed to use PET with radioactively labelled GSK1034702 to help ascertain the role PGP plays in limiting brain penetration in the presence and absence of a pharmacological relevant oral non-labelled dose of 5 mg. Here, we investigated the distribution of GSK1034702 in the living human brain. These data provide vital information to determine whether GSK1034702 can be used at doses that offer therapeutic benefit to patients with AD and SZ without inducing intolerable muscarinic-related side effects. [11C]GSK1034702 was prepared as described previously  via a palladium-catalysed cross coupling reaction between GSK1804165A and [11C]CH3I (Figure 1). Synthesis route for [ 11 C]GSK1034702. The brain distribution of carbon-11-labelled GSK1034702 ([11C]GSK1034702) was conducted in two anaesthetised baboons (P. anubis), to assess its transport across the BBB. These studies were conducted at Columbia University Medical Center, New York. The study was approved by the Columbia University Institutional Animal Care and Use Committee (IACUC). Two adult baboons were studied over a 6-week period. Subject A (an ovariectomised female) received two injections of [11C]GSK1034702 22 days apart, while subject B (male) received a single injection of [11C]GSK1034702. Each experimental session included a single dynamic PET scan. Fasted animals were immobilised with intramuscular ketamine injection (10 mg/kg), and anesthetised with 1.8% isoflurane via an endotracheal tube. Vital signs were monitored every 10 min and the temperature was kept constant at 37°C with heated water blankets. An intravenous (IV) perfusion line was used for hydration and injection of the radiotracer. A catheter was inserted in a femoral artery for arterial blood sampling. The head was positioned at the centre of the field of view. PET imaging was performed with the ECAT EXACT HR + PET scanner (Siemens/CTI, Knoxville, TN) operating in 3D mode (in-plane resolution of 4.3, 4.5, 5.4 and 8.0 mm, full width at half maximum (FWHM) at a distance of 0, 1, 10 and 20 cm from the centre of the field of view) . A 15-min transmission scan was obtained prior to radiotracer injection for attenuation correction. The injected mass and radioactivity had an upper limit of 1.16 μg and 47 MBq, respectively. Following IV administration (45-s bolus) of a single dose of [11C]GSK1034702 dynamic PET, arterial blood and metabolite data were acquired for 120 min (subject A) for the first two scans and only 60 min for the third scan due to a technical issue (subject B). Regions of interest (ROIs) were drawn on previously acquired T1-weighted anatomical magnetic resonance imaging (MRI) brain images for each animal. The following regions were defined: cerebellum, hippocampus, thalamus, striatum, frontal cortex and occipital cortex. Regions were drawn in the MEDx (Sensor Systems Inc., Sterling, VA, USA) software environment. PET emission data were attenuation-corrected using the transmission scan, and frames were reconstructed using a Shepp filter (cutoff 0.5 cycles/projection rays). Decay-corrected PET images were registered to the MRI images by maximisation of mutual information using SPM2 and Matlab software. 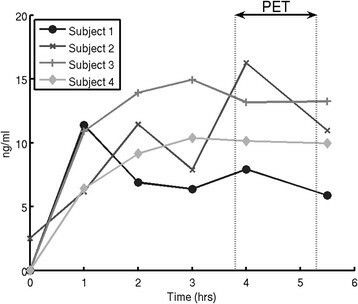 Regional boundaries were transferred from the MRI to the individual registered PET frames, and time-activity curves were measured in the MEDx environment. Right and left regions were averaged. For a given animal, the same regions were used for all scans. For all non-human primate studies, the non-protein-bound fraction of [11C]GSK1034702 in arterial plasma (fP) was quantified using the following methodology: triplicate 200 μL aliquots of plasma collected before injection were mixed with [11C]GSK1034702, pipetted into ultrafiltration units (Centrifree; Amicon, Danvers, MA, USA) and centrifuged at room temperature (20 min at 4,000 rpm). At the end of centrifugation, plasma and ultrafiltrate activities were counted and fP was calculated as the ratio of ultrafiltrate to total activity concentrations. Brain time activity curves (TACs) were corrected for the contribution of blood activity assuming a 5% blood volume. A metabolite-corrected arterial input function and regional TACs were fitted to a compartmental model to derive regional VT estimates as well as a whole brain VT.
An open-label PET study (GSK study number 110771) was conducted to assess the transport of [11C]GSK1034702 across the BBB and its distribution in the living human brain. Four healthy males aged between 35 and 55 years old, with body mass index (BMI) between 19.0 and 29.0 kg/m2, and the absence of past or present neurological, medical or psychiatric illnesses and concomitant medications were enrolled. Clinical status was assessed by history, physical examination, routine blood tests, urine toxicology and electrocardiogram. All subjects provided written informed consent. The study was approved by the Edinburgh Independent Ethics Committee for Medical Research and permission to administer radioisotopes was obtained from the Administration of Radioactive Substances Advisory Committee of the UK. Subjects were recruited by and monitored by the Hammersmith Medicines Research (HMR) clinic. All scanning procedures were performed at the GlaxoSmithKline Clinical Imaging Center, Hammersmith Hospital, London. Each subject underwent a single study day, during which PET imaging was performed. T1-weighted structural MRI scan was performed for all subjects to provide neuroanatomical information. A tracer dose of [11C]GSK1034702 (mass <50 μg) was administered as an IV bolus immediately before each PET scan. During the scanning day, each subject received a baseline [11C]GSK1034702 scan, followed by a single 5-mg oral dose (p.o.) of GSK10347012 and a subsequent [11C]GSK1034702 scan approximately 4 h post-dose. Subjects returned to the clinic for a follow-up visit 7 to 14 days following the oral dose of GSK1034702. Dynamic PET data were acquired using a Siemens Biograph 6 Truepoint with TrueV PET-CT (Siemens Healthcare, Malvern, PA, USA) in three-dimensional (3D) mode. A computed tomography (CT) scan was acquired for attenuation correction of PET data prior to administration of the radiotracer. A cannula was inserted under local anaesthesia into the radial artery, contralateral to the tracer injection site, and used to collect arterial blood samples to estimate the time course of radioactivity and metabolism of GSK1034702. The radiotracer was administered as an IV bolus over 20 s, and dynamic PET data were acquired for 90 min. The injected mass of GSK1034702 did not exceed 50 μg. Arterial blood radioactivity was measured continuously for the first 15 min after [11C]GSK1034702 injection, using a continuous sampling system (ABSS Allogg, Mariefred, Sweden). In addition, 12 serial discrete blood samples were obtained (at 5, 10, 15, 20, 25, 30, 40, 50, 60, 70, 80 and 90 min post injection), to determine whole blood and plasma activity. Seven samples (at 5, 10, 20, 30, 50, 70 and 90 min) were further processed by HPLC to measure the fraction of plasma activity representing unmetabolised GSK1034702. For all human studies, the non-protein-bound fraction of [11C]GSK1034702 in arterial plasma (fP) was assessed by ultrafiltration for the blood sample taken at the beginning of the scan. High-resolution (HR) 3D volumetric MRI scans (MPRAGE sequence: TR = 3,000 ms, TE = 3.66 ms, flip angle = 9°, voxel size = 1 mm3, 208 slices) were acquired on a 3 T Tim Trio MRI scanner system (Siemens Healthcare) to provide a T1-weighted image for co-registration with their PET data. Serial venous blood samples were obtained at 0, 1, 2, 3, 4 and 5.5 h after the administration of a single oral dose of 5 mg of GSK1034702, to estimate the time course of GSK1034702 plasma concentration. Plasma samples were analysed using a validated analytical method. Emission PET data were binned into 26 frames (durations: 8 × 15 s, 3 × 60 s, 5 × 2 min, 5 × min, 5 × 10 min) and reconstructed using Fourier re-binning and a two-dimensional (2D) filtered back projection algorithm with a ramp filter . Image data were then smoothed with a Gaussian filter (5 mm FWHM). The PET reconstruction process included corrections for scatter, randoms and attenuation . Dynamic PET data were corrected for motion via frame-to-frame image registration and aligned with the structural T1 MRI image using SPM5 (Wellcome Trust Centre for Neuroimaging, http://www.fil.ion.ucl.ac.uk/spm) with a mutual information cost function. The CIC Neuroanatomical Atlas  was non-linearly deformed into the individual's space to obtain a personalised anatomical parcellation of ROIs. These ROIs were applied to the dynamic emission data, and regional TACs were obtained for the whole brain, frontal cortex, occipital cortex, striatum, thalamus, hippocampus and cerebellum. In addition, as some degree of regional heterogeneity was observed in the binding of [11C]GSK1034702 in the human brain, a regular-sized rectangle (432 mm3) was manually placed over the area of highest signal in the medial temporal lobe (MTL), centred in the hippocampus for each subject and applied to the dynamic emission data to generate a MTL TAC. See Additional file 1: Figure S1A, for further methological details of ROI definition. Regional TACs with an arterial plasma metabolite- corrected input function were fitted using compartmental analyses, and estimates of the delivery rate constant for transfer from arterial plasma to tissue (K1) and VT were obtained. VT estimates derived were compared to in vitro estimates derived from equilibrium dialysis to investigate the BBB transport process. The kinetic parameters from the PET studies were applied to the pharmacokinetic (PK) data from the individual subjects in order to estimate the regional distribution of GSK103702 following an oral dose. The in vitro brain and plasma protein binding of GSK1034702 across a range of species was determined using equilibrium dialysis as described previously . The injected dose of [11C]GSK1034702 was 27.7 ± 17.7 MBq (with these and subsequent values expressed as mean ± standard deviation [SD]), with the average injected mass of 1.05 ± 0.05 μg. The free fraction of [11C]GSK1034702 in plasma (f P) was 0.54 ± 0.21. A two-tissue compartmental model was identified as the most appropriate kinetic model based on parsimony criteria and was used to derive regional VT values. The distribution of [11C]GSK1034702 was homogenous throughout the brain, with regional VT values of similar magnitude (see Table 1 and associated K1 values are reported in Additional file 2: Table S1A), suggesting that any specific binding component of [11C]GSK1034702 is small compared to the ‘free and non-specific’ binding component. The whole brain VT for [11C]GSK1034702 in the P. anubis brain was 3.97 ± 0.38. There was high uptake in the pituitary which is situated outside the BBB. VT = volume of distribution (mL.cm−3). A total of four male subjects, with a mean (±SD) age of 43.5 ± 5.1 years and a mean (±SD) BMI of 26.6 ± 2.9 kg/m2, were enrolled into the study. In all, five technically adequate data sets were obtained in three subjects (three baseline scans and two scans following the administration of oral GSK1034702). The post-dose scan for subject 1 was not performed due to the failure of [11C]GSK1034702 synthesis, while the acquisition of arterial blood data for both scans of subject 3 was compromised by problems with a blood sampling device, and hence, a quantitative tracer kinetic analysis of the scans from this subject was not performed. The mean (±SD) injected dose of [11C]GSK1034702 was 308 ± 26 MBq, with a mean (±SD) injected GSK1034702 mass of 42.9 ± 5.2 μg. A single oral dose (p.o.) of 5 mg GSK1034702 was well tolerated. One subject experienced two mild and transient adverse events during this study (salivary hypersecretion and dysgeusia). Both adverse events were considered to be drug-related. No serious adverse events were observed. The plasma concentration of GSK1034702 following the administration of 5 mg p.o, and the measured free fraction in the plasma are presented in Table 2. The dose for all subjects was 5 mg of GSK1034702. Time given is the time in hours post oral dose of GSK1034702 at which the PET scan acquisition started. GSK1034702 PK concentrations were taken between results from the start of the scan are taken between 4 and 50 min before the PET scan. In vivo plasma-free fractions were measured from plasma samples acquired from the four subjects during each PET scan. fP = plasma-free fraction. [11C]GSK1034702 underwent minimal metabolism over the time course of the PET scan during both the baseline and the post-dose sessions (Figure 2). Following the administration of oral GSK10347012, the plasma concentration reached peak levels by the time of the post-dose scan in all subjects and remained relatively constant over the course of the PET scan (Figure 3). The plasma concentrations achieved were consistent with the prediction based on the First-Time-In-Human safety and tolerability study (GSK study number 110623 and study number NCT00743405 on CT.gov). Parent fraction of [ 11 C]GSK1034702 over the time course of the PET scan for all subjects ( N = 4). Error bars denote the Standard Deviation of the [11C]GSK1034702 parent fraction. 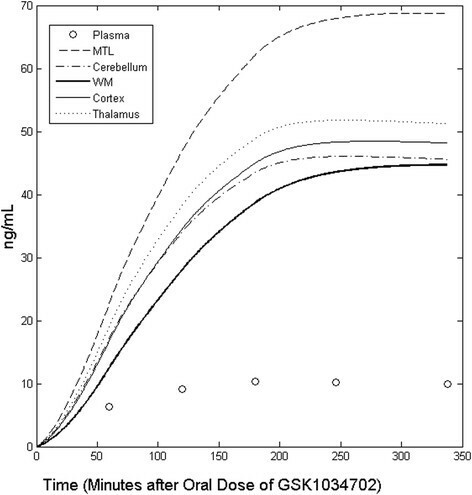 Clinical Study plasma concentration of GSK1034702 over time (in h). Subjects were scanned between 3 and 5 h after a single oral dose of GSK1034702. Figure 3 shows that PK levels of GSK1034702 had reached a peak in all subjects prior to the acquisition of the PET data. The regional brain TACs for all scans analysed are presented in Figure 4 and distribution by a representative subjects integral image in Figure 5. A two-tissue compartmental model was identified as the most appropriate kinetic model based on parsimony criteria, which employed the Akaike information criteria  for model selection, and was used to derive regional VT values (Table 2). Regional time activity curves of [ 11 C]GSK1034702 in the human brain and model fits. Regions of interest: white circle, MTL = medial temporal lobe; x, cerebellum; white square, thalamus; diamond, cortex = sum of cortical regions including both cortical grey and white matter; plus sign, WM = all cerebral white matter. Solid lines are two tissue compartmental model fits. For each subject, a regular-sized rectangle (432 mm3) was manually placed over the area of highest signal in the medial temporal lobe (MTL), centred in the hippocampus; this is presented in the data as the MTL ROI. [ 11 C]GSK1034702 in Subject 4 in the human brain. Tracer [11C]GSK1034702 PET data - integral images 0-120 min in subject 4. Post dose 5 mg of GSK1034702 [11C]GSK1034702 PET data - integral images 0-120 min in subject 4. K1 = rate constant for transfer from arterial plasma to tissue (mL.cm−3.min−1). VT = volume of distribution (mL.cm−3). Regions of interest: MTL = medial temporal lobe (ROI defined above), cerebellum, thalamus and striatum and cortex = sum of cortical regions (includes grey and white matter); white matter = all cerebral white matter. As opposed to the non-human primate data, there appeared to be some regional heterogeneity in the distribution of [11C]GSK1034702, with the VT in the MTL in the range of 7-13, while that in the white matter being in the range of 4-5. The whole brain VT in humans was 4.9. We did not expect to see displaceable [11C]GSK1034702 binding, and hence did not expect a change in binding following the administration of an oral dose of 5 mg GSK1034702. As expected, we saw no significant change in either VT or K1 for [11C]GSK1034702, however, there was a non-significant reduction in the MTL area in both subjects where following administration of 5 mg of GSK1034702 (see Table 3 and Figures 4 and 5). Regions of interest: MTL = medial temporal lobe (ROI defined above), cerebellum, thalamus and striatum and cortex = sum of cortical regions (includes grey and white matter); white matter = all cerebral white matter. K1 = rate constant for transfer from arterial plasma to tissue (mL.cm−3.min−1). VT = volume of distribution (mL.cm−3). GSK1034702 injected mass in microgrammes. [11C]GSK1034702 injected dose in megabecquerel. The kinetic parameters derived from the two-tissue kinetic model were applied to the plasma pharmacokinetic data from individual subjects in order to estimate the regional pharmacological GSK1034702 concentration time course following an oral dose. These data predict a peak brain concentration only slightly later than that in the plasma, indicative of a rapid exchange of GSK1034702 across the BBB (see Figure 6 for illustrative results from subject 4). Predicted time course of GSK1034702 concentration in the human brain following a single 5-mg oral dose in subject 4. Regions of interest: MTL = medial temporal lobe (defined above), WM = all cerebral white matter, cortex = sum of cortical regions (including grey and white matter), plasma = the measured plasma concentration of GSK1034702 for comparison. The in vitro plasma protein and brain tissue binding of GSK1034702 were determined in mouse, rat, dog, marmoset, monkey and human tissue by equilibrium dialysis. The bound fractions in plasma and brain were similar in all species tested (Table 4). Plasma protein binding and brain tissue binding of GSK1034702 evaluated by equilibrium dialysis over 5 h at concentration of 1 μg/mL. Values represent mean ± standard deviation from n = 6 determinations, fP = plasma-free fraction, fND = brain-free fraction. CD = Sprague Dawley rat and LH = Lister hooded rat. The in vitro equilibrium dialysis fP values for the monkey and human plasma (0.58 and 0.44, respectively) were consistent with the values obtained by ultrafiltration in the course of the PET studies in baboon and human plasma in vivo (0.54 and 0.45, respectively). Monkey brain fND (=0.17) data was used for both human and baboon estimation. The fP/fND ratios derived from the equilibrium dialysis estimates indicated that if GSK1034702 crosses the BBB by passive diffusion, the expected VT would be 3.4 and 2.6 in the primate and human brain, respectively. The VT measured in the primate and human cortex (4.0 and 4.9) is in broad agreement with a passive diffusion model. The exploding costs of drug development, and in particular in the neurosciences, make it imperative that decisions about compound progression are made as early as possible, in order to terminate unsuitable candidates before they reach later, more expensive phases of development. The fundamental requirement of any new molecule is that it is able to reach its site of action in pharmacologically meaningful quantities, at doses which are generally safe and tolerable. The quantification of target engagement in the CNS is hampered by our inability to directly assay the target in the living human brain and the frequent species differences encountered. The direct quantification of drug interaction with its target via the use of PET with a selective radioligand is the method of choice in deriving the relationship between the plasma concentration of a compound and the occupancy of its target. 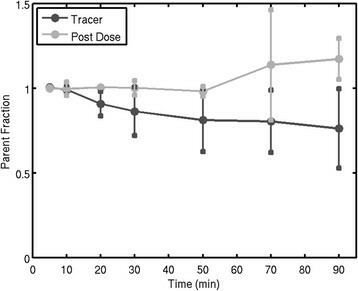 This technique can provide information on target occupancy following single-dose administration that can be extrapolated to provide accurate estimates of occupancy in the clinically meaningful setting of repeat-dose administration . A large fraction of CNS targets of interest are not suitable for examination by this method, due to the lack of suitable radioligands. In such situations, the traditional approach has been to label the molecule of interest and derive the partition coefficient between the labelled drug in plasma and in the brain, as a semi-quantitative measure of drug availability at the target. Such measures are useful, but more limited than direct estimates of target occupancy, since the partition coefficient (known in the PET literature as the total volume of distribution, VT) provides quantification of the total concentration of the drug in the brain. The total concentration is composed of the drug specifically bound to the target (VS) and the non-displaceably bound drug (VND), which comprises drug-bound non-specifically as well as the free drug. If the VS can be estimated robustly from kinetic data, direct target engagement may be evaluated, using the methods developed for target-specific radioligands. However, this situation is rare for drugs in development, primarily due to the presence of high levels of non-specific binding (high VND). Hence, for a large proportion of labelled drugs, the measured VT is essentially equivalent to VND. The pharmacologically relevant fraction of the drug is the free concentration, CFT, which is able to interact with the target, and the fND is needed to estimate CFT when only the total tissue concentration is available. If the drug transport across the BBB is by passive diffusion, then at equilibrium, the free concentration of the drug in plasma would be equal to CFT. A demonstration that the VT for a compound is approximated by the ratio fP/fND provides confidence in drug transport by passive diffusion and hence the estimation of CFT from peripheral plasma data. We did not see conclusive evidence for a change in regional VT values for GSK103702 following a pharmacological dose that was statistically significant, suggesting that any specific binding component of [11C]GSK1034702 is negligible compared to the free and non-specific components. The whole brain VT in human was 4.9, which is broadly comparable to the measured fP/fND of 2.63, implying passive diffusion across the BBB. The difference between VT and fP/fND is most likely due to experimental noise in the PET and equilibrium dialysis assays, but even if this difference represents a deviation from passive diffusion across the BBB, this deviation would be in the direction of an active transport of the molecule into the brain. Such a situation, were it to be clinically relevant would lead to a higher brain CFT than the plasma-free concentration, and thus would minimise the incidence of peripheral side effects for a given central m1AChR occupancy. Similarly, there was significant uptake of GSK1034702 into the brain at tracer quantities and following oral dosing of 5 mg in the human study. As there was some regional heterogeneity in the binding of GSK1034702 in the human brain, the cortex was used to derive a VT assumed to be the most representative of the VND, as this region produced VT in the lower range of those examined. The whole brain VT was 4.9, which is in broad agreement with primate VT and the fP/fND ratio (3.97 and 2.63, respectively). The results are broadly consistent across species, although the primate and human estimates are somewhat higher than the fP/fND ratio. Thus, if active transport plays a role in the BBB passage of GSK1034702, it would appear to be an active influx into the brain (leading to VT > fP/fND), rather than an extrusion of the compound from the brain (which would lead to VT < fP/fND). Thus, if anything, therapeutic levels of m1AChR occupancy may be achieved with even lower plasma concentrations and hence lower incidence of adverse events, than those in the passive diffusion scenario. The presence of an active transport mechanism would make extrapolation from tracer studies to pharmacological doses more problematic, due to possible changes in the transport kinetics at higher doses (e.g. due to saturation of the transporters). However, we do not think that this is an issue for GSK1034702, as our examination of a therapeutically relevant dose (5 mg p.o.) produced results similar to those at tracer dose. The inclusion of a therapeutic dose requires extra safety information and complicates the study design, but may be worth including in situations where active transport is suspected. A regionally heterogeneous distribution of [11C]GSK1034702 was observed in humans, with the highest VT observed in the medial temporal lobe (MTL), consistent with the known distribution of m1AChR in the human brain . This finding is supported by a small (but non-significant) reduction in the MTL VT following the administration of a 5-mg oral dose of GSK1034702, in both subjects for whom pre- and post-dose data was available. Our data are consistent with a small specific binding component for [11C]GSK1034702 in the human brain. The data from humans are in contrast to those in the baboon brain, where homogenous distribution was observed. A potential explanation for the between species differences in distribution could be a masking of high affinity states of m1AChR by ketamine , in the baboon brain. However, further studies would be needed to properly understand these differences. The magnitude of the specific component may be too low for [11C]GSK1034702 to be a useful PET ligand for the m1AChR. This may be due either to a relatively low in vivo affinity of [11C]GSK1034702 for the m1AChR in relation to the target density or due to a relatively low specific activity (SA) and hence a high mass of GSK1034702, leading to partial blockade of the specific binding component being used in this study. The radiolabelling method used precludes the achievement of higher SA than reported here, and hence, [11C]GSK1034702 may not be suitable for the quantification of m1AChR density with PET. However, it may provide a useful lead in the search for related compounds with higher affinity for this target or compounds that may be labelled using methods leading to higher SA. This study type has several limitations. For the PET data, the presence of brain-penetrant metabolites cannot be ruled out for all compounds using these methods. In this case, it is unlikely because there was little metabolism of the compound and because the data was well described by a two-tissue compartment model. For the equilibrium dialysis data, the duration of dialysis, temperature and buffer conditions and the fact that different primate brains were used for the in vitro and in vivo data of the primate study, as well as primate brain instead of human brain tissue for the human study, could all introduce errors into the measurements. In primate and human PET studies designed to evaluate the transport across the BBB of a novel selective M1 receptor allosteric agonist GSK1034702, we have demonstrated good brain uptake. Although there was variability in this limited dataset, BBB kinetics were consistent with passive diffusion or active influx. The single oral dose of 5 mg GSK1034702 was well tolerated by healthy subjects in this PET study, and the pharmacokinetic parameters were consistent with those observed in a separate First-Time-In-Human safety and tolerability study (GSK study number 110623 and study number NCT00743405 on CT.gov). In conclusion, an examination of the BBB kinetics of GSK1034702 in phase 0 and phase I of development has discharged some of the perceived development risks for GSK1034702 and provided information to progress the molecule into the next stage of clinical development. The authors acknowledge the contributions made by the GSK1034702 project team. In addition, we would like to acknowledge the contribution of Hammersmith Medicines Research staff. We thank Louisa Pettinger who provided medical writing services on behalf of GlaxoSmithKline. In addition, thanks are given to Elizabeth Hackett, John Castrillon and Sung A. Bae from the Department of Psychiatry, Columbia University College of Physicians and Surgeons, New York, NY, USA. The study was sponsored by GlaxoSmithKline (study number 110771) and the protocol was posted on clinicaltrials.gov (identifier NCT00937846) prior to study initiation. The study was sponsored by GlaxoSmithKline (GSK) pharmaceuticals [study number 110771 and ClinicalTrials.gov Identifier NCT00937846]. All authors except AAD and MS were employees of GSK and held shares in the company at the time of this study. AAD and MS had previously received funding by GSK. KR carried out the human PET studies and drafted the manuscript. VC performed quantitative analysis of the human PET study, helped design the human PET study and helped draft the manuscript. MH designed and optimised the method to radiolabel [11C]GSK1034702 for use in humans and synthesised [11C]GSK1034702 used in human studies. LM designed and optimised the method to radiolabel [11C]GSK1034702 for use in primate studies and helped draft the primate studies section of the manuscript. SPM performed quality control (QC) and the QC analytical method development for [11C]GSK1034702 for use in human studies. JP performed metabolite analysis and the metabolite analytical method development for in the human PET study. RNG assisted with quantitative analysis of human PET data and helped draft the manuscript. GS helped design the analysis pipeline and performed the image processing for the human PET study. AAD participated in the design and coordination of the primate PET study. MS performed image processing and quantitative analysis of the primate PET study. JW helped obtain brain protein binding data for GSK1034702 and provided input into interpretation of the results in relation to the biology of the target. ML conceived of the study and participated in its design. EAR designed the PET studies and drafted the manuscript. All authors read and approved the final manuscript.